Hey everyone! It’s Natalia here, HEAL’s Community Manager & Holistic Nutritionist. The warm weather is upon us! 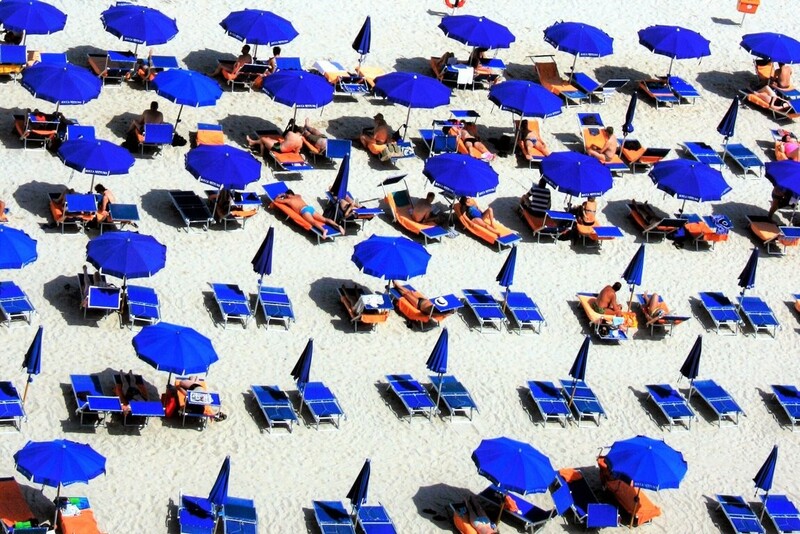 The parks, beaches and patios have come alive with sunbathers. Before you go and stock up on your go-to sunscreen for the coming months, we thought this would be a good opportunity to talk about safer sunblock. You might not think of sunscreen as being a source of potentially harmful ingredients, but like other personal care items, many contain ingredients that are considered carcinogenic, pollutants and hormone disruptors. Octinoxate and oxybenzone for example, are the two ingredients recently under fire for killing the coral reefs (they can be found in sunscreens by Banana Boat, Neutrogena or Coppertone) and they’ve recently been banned in Hawaii for this reason. But like what you eat or drink, you should care just as much about what’s in your sunblock, especially if you wear it every day. A study in the American Journal of Public Health found that the skin absorbs at least 64% of chemicals in drinking water (i.e. through your shower head). And if sunscreen is literally killing the coral reefs, think about what it’s doing to your skin! Luckily, there are a lot of sunscreen options considered safe for you and the environment, many of which are actually more effective at protecting you against the sun. To help you navigate the information and some of the confusion generated by marketing jargon, we’ve broken it all down for you below including which ingredients to avoid and which ones are considered safe. The Environmental Working Group (EWG) created this table for nine FDA-approved sunscreen chemicals, which you’ll find below. These are ingredients you’ll commonly find in North American sunscreens. These are ingredients found in the majority of skin care products on Canadian shelves that are considered carcinogens, pesticides, reproductive toxins and hormone disruptors like parabens and BHA. We recommend avoiding them in sunblock and other skincare products. The full list can be found here. 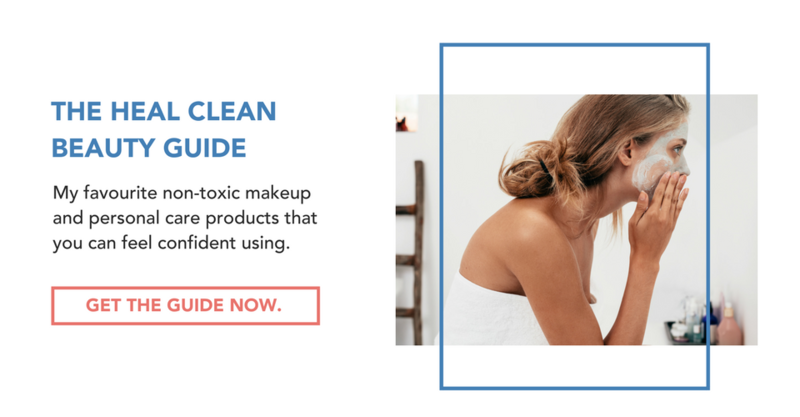 If you’re looking to clean up your makeup bag, click here for the HEAL Clean Beauty Guide, where we share our favourite non-toxic but effective beauty products. Retinyl palmitate is a form of Vitamin A often used as an antioxidant that combats skin aging. The problem is that when used on the skin in the presence of sunlight, research indicates it may trigger the development of skin tumours and lesions. It’s best to avoid skincare products with Vitamin A altogether; this includes sunscreens, moisturizers with SPF and lip products. Mineral sunscreens use minerals like zinc oxide or titanium oxide as the active ingredients. They reflect rays off the skin to protect it. Chemical sunscreens are the ones most of us grew up using and they use a combination of chemical ingredients like oxybenzone, avobenzone, octisalate, octocrylene, homosalate, and octinoxate. Through a chemical reaction they change UV rays into heat and release the heat from the skin. If you reference the chart above, mineral sunscreens are considered safer for you and the environment. Of all the currently approved ingredients, zinc oxide takes the cake. Previously, zinc oxide was the thick white sunscreen you’d associate with the noses of surfers and lifeguards, but modern-day zinc oxide can go on clear and transparent. It doesn’t break down in the sun, has few health concerns and can protect against both UVB and UVA rays, which is a must (as we’ll explain shortly). Titanium oxide does all of this and is regarded as safer than most chemical sunscreens, but still offers less UVA protection than zinc oxide. UVB and UVA are the two rays emitted by the sun that damage the skin. Ultraviolet B rays are the primary cause of sunburn and non-melanoma cancer while Ultraviolet A penetrates deeper into the skin and can impair the immune system, create harmful free radicals to form in skin, and is associated with higher risk of developing melanoma. Most sunscreens in North America only protect against UVB, so they suppress sunburn, leading you to think you’ve safely protected your skin and can stay out longer. The ones that do offer “broad spectrum” protection, meaning UVB and UVA protection still aren’t even strong enough to be sold in Europe, where the standards are higher. What’s even more alarming is that high SPF products may not actually be high SPF. Research into their competitors by Proctor & Gamble found that just changing the light transmission in the lab by 1.7 percent turned a 100 SPF product into a 37 SPF product. Most people also apply significantly less sunscreen than what is used in the FDA mandated tests. In other words, the testing conditions for sunscreen can really alter the results and are very different from the real-life conditions to which they’re applied. Individuals wearing high SPF can sometimes take it as a cue to wear less or apply it less often. We would assume that an SPF of 100 would provide double the protection of SPF 50, when in reality an SPF of 50 (when applied correctly) provides 98% UVB protection and an SPF of 100 actually only provides 99% protection. The Environmental Working Group found that when used correctly, even most people highly prone to burning will get adequate protection from SPF values between 30 and 50. And what makes a product higher SPF? More sun-filtering chemicals of course. So applying a chemical-based sunscreen with a very high SPF may be just as effective as a lower SPF sunscreen but expose you to more harmful chemicals at once (source). We're not saying high SPF is bad - just know it may not be giving you that much more protection. Choose mineral sunscreens containing zinc oxide or zinc dioxide as the primary active ingredient. Look for Reef Safe products. When using a spray, use a non-aerosol mineral-based spray like the Countersun Mineral Sunscreen Mist by Beautycounter. This product has been tested to ensure there’s no potential risk of respiration when sprayed. Avoid the products with medium to high toxicity concerns listed in EWG chart referenced above, the “dirty dozen” list and Vitamin A (retinyl palmitate). If you’re in a store and are unsure if a sunscreen meets the above characteristics, you can search it using the EWG’s Healthy Living App by using the product name or the bar code! 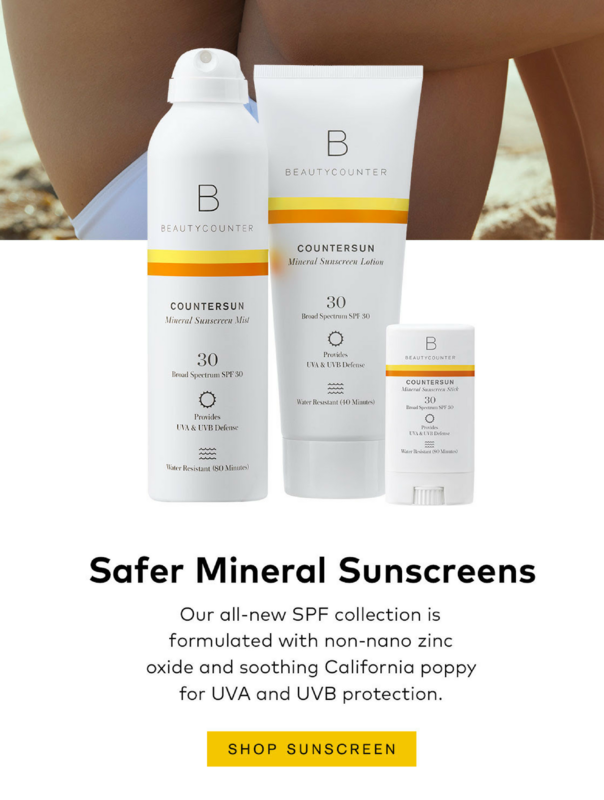 It should come as no surprise that some of our favourite safe sunscreen products are by Beautycounter. Their Countersun sunscreen options include lotions, sprays, and even sticks that come in full or travel sizes. We love them because they use zinc oxide as the primary active ingredient and it goes on smooth and blends evenly. As an added bonus, all Beautycounter products are free of 1500 questionable or harmful chemicals, even if they aren’t banned by the FDA or Health Canada. Click here to browse their Countersun line.